Taiwan Manufacturer of Gifts and Promotion Items. 1. Cloisonne (hard enamel); cloisonne with printing. 2. 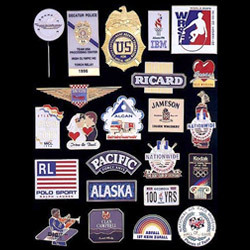 A profession manufacturer of varied custom lapel pin products, such as hard enamel lapel pin, soft enamel lapel pins, printing lapel pin, promotional lapel pin, logo lapel pins, eagle lapel pins, pewter key chain, keychain, flashing lapel pin, necklace, patch, medal etc. 1. OEM and ODM are welcomed. (1) Trade shows, conventions, or sales meeting giveaways. (2) Corporate identity and image building. (3) Product branding and introduction. (4) Employee and customer recognition. (5) Lapel pins are great at trade shows, convensoin, or sales meeting.